When it comes to pregnancy period, the most painful thing is the enlarging belly (probably around the 5th or 6th months) that creates lots of pressure and causes pain, discomfort and stress, especially on the back, abdomen, hips and pelvis. For alleviating the pain or pressure, maternity support belts are specially designed to offer proper support around the belly. Size: You should go for the right size, not too loose nor too tight. A loose one won’t offer the best belly support while a tight one increases the pressure on the uterus. Comfort: It should be made from high-quality materials that are soft and smooth on the skin as well as come with user-friendly straps; for instance, Velcro strap. Ergonomic: The purpose of the support belt is to alleviate pain and pressure, so it is important to make certain they are ergonomically-designed. Improve Mobility: Current Reviews in Musculoskeletal Medicine published in 2013 showed that aerobic exercise provides many health benefits, especially improve the mood during pregnancy that can decrease maternal hypertension and gestational diabetes. Therefore, by firmly supporting the belly and minimizing aches, the belts give a great support for this kind of exercises and improve the mobility of the pregnant women. wear no more than two or three hours per day to prevent from over pressure on the uterus. Although the maternity support belts might look similar, it is vital to research and compare the different belts to seek for the best before making an order. The adjustable maternity support belt by Mamu’s Best comes with a breadth/width of 6.5 inches and is ideal for sizes 36 up to 52 inches. It comprises of 3 materials (cotton, nylon and spandex) that provide good elasticity and support at the same time. Besides being lightweight, the belt is also breathable allowing good air and blood circulation while the adjustable Velcro straps can be customized to meet the designed size. The belt is, however, not very big hence not quite fit for large bellies. The maternity support belly by Soft Form comes in universal medium size (6-14) and is fit for pregnant women affected by lower back pain. The fully-adjustable belt will accommodate the growing baby bump at the different stages and the user doesn’t have to buy another one as time goes by. The good belt support eradicates discomfort, tiredness and pain on the abdominal and lumbar regions and also encourages good posture. The maternity support belly by Enjoy Colorful Life offers belly and back support and prevents strain and aches. It features a double-layered laminate that is made out of 80% nylon and 20% spandex while the inner lining is made from 100% polyester. It comes with 6 memory steel for relieving waist and back pain, tightening the pelvis after birth, preventing tenesmus sense and stabilizing fetus position. The breathable material absorbs perspiration and moisture and boosts circulation of fresh air while the super strong easy-to-adjust Velcro straps prevent Uterus Prolapse, falling and protect ligaments. 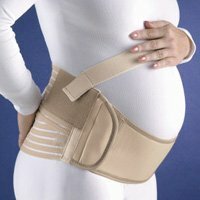 Enjoy good belly support, minimum pain and fatigue during your pregnancy by acquiring the ZaryzzA maternity belt. Made from elastic and breathable fabric, the one-size belt will expand to accommodate different belly sizes and is suitable for the entire pregnancy period. This is boosted by the adjustable Velcro straps that also help in gently lifting the belly and minimizing lower back pain and discomfort. The maternity support belt is designed to support belly circumference of up to 48 inches/US size 22. The maternity support belt by Yosoo is adjustable and fits waist sizes of up to 46 inches. Made from breathable cotton and spandex, the fairly stretchy belt is lightweight and offers good compression and is still soft on bare skin. It is also easy to wear and remove and offers all-round support to the belly, back and hips and will remain unnoticeable under clothes. Besides offering belly support it also helps relieve fatigue on the pelvic region, spine, muscles. Experience no pain, no pressure and no discomfort in your pregnancy by acquiring the pregnancy belt by Zenda Naturals. Made from ultra-soft fabric, the belt with the comfortably fit around your belly and absorbing the pressure throughout the pregnancy. In addition to relieving pain from the belly, pelvis and back, the breathable abdominal binder also minimizes excess sweating making you comfortable even in high temperatures. HYBLOM maternity belt is a mom-friendly belt, which is made from a breathable material that is comfortable to the enlarged belly. The innovative belt comes with an abdominal binder that comfortably wraps around the belly and is supported by 2 adjustable Velcro straps. It enhances hip stabilization, relieves sacroiliac, pelvis, ankle and leg pain, improves blood circulation, reduces fatigue, swelling and also encourages postnatal muscle healing. 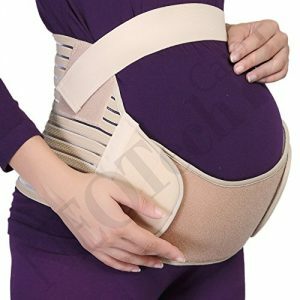 The maternity support belt is most suitable for larger frames. 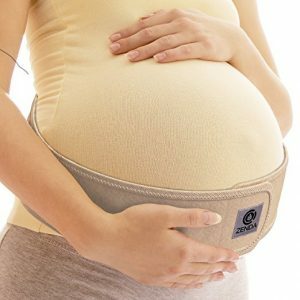 Rated as one of the best, the maternity support belt by NeoTech Care is very elastic yet comfortable and can support different belly sizes. It’s made from 40% Polyester and 60% Nylon and comes with an innovative and ergonomic design that provides full support to the belly, back, pelvis and the back as well. The fully-adjustable belt is ideal for the first trimester all the way to the last trimester thanks to the multi-layered laminate that provides good ventilation and compression as well as the abdominal lift attachment. Made from 80% polyester and 20% Lycra, the maternity support belt by Gabrialla is one of the most elastic in the market. Nonetheless, it offers firm support and will relieve pain and pressure from the belly, back, uterus and also the hips. 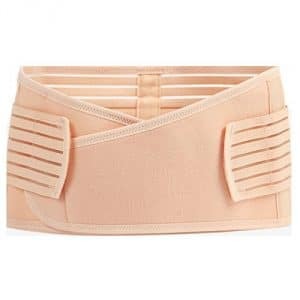 The OB/GYN’s recommended belt is 6 inches wide and is also ideal for cold/hot therapy, preventing stretch marks and enhancing proper posture whether walking or sitting down. Being a medium size belt, it isn’t very recommended for women with large bellies. Consisting of a breathable abdominal binder, the AZMED maternity support belt relieves pain, fatigue and pressure that come with pregnancy. It provides mild compression around the baby bump and minimizes unnecessary movement that strains the back, pelvic and abdominal region. The one-size belt consists of a soft and breathable material that enhances comfort and can fit belly sizes of up to 46 inches. The pregnancy period doesn’t have to be a painful and uncomfortable episode. Also, you should not put your unborn baby’s life or yours at risk because of using the wrong belly support. The best solution is going for best maternity support belts that are comfortable, ergonomic, user-friendly, durable. Have you made your pick?